The Katherine M. Edwards, nearly three decades in the making, is the first “working bugeye” on the Bay in nearly 90 years. Her late-afternoon debut on the Miles River was greeted by light air and flat water that left her builders smiling. 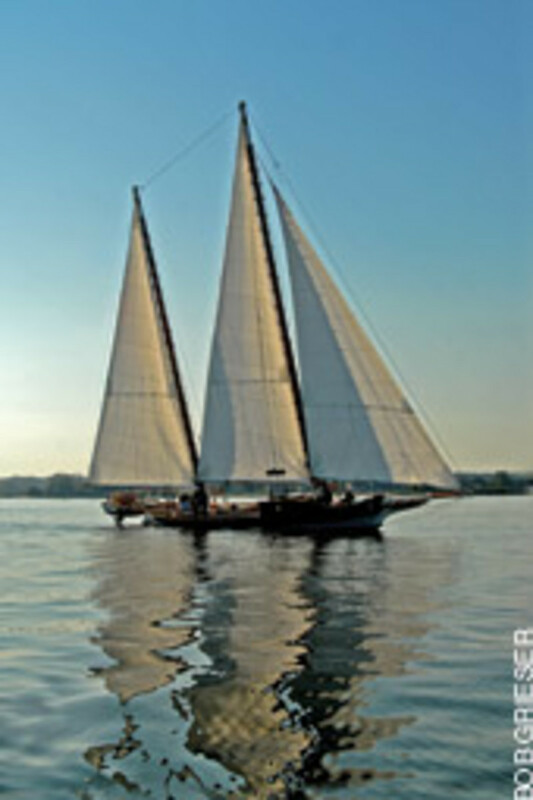 The Katherine M. Edwards ghosted through the dusk and into the inner harbor of the historic colonial port of St. Michaels, Md., and skipper Sidney Dickson deftly sailed the 44-foot bugeye to its temporary berth alongside the public waterfront. Back-winding the jib, the small crew landed just as oystermen, clammers and freighters did in the late 1800s, during the heyday of sail on Chesapeake Bay. Hours earlier, droves of boaters and tourists had passed along the promenade from the Chesapeake Bay Maritime Museum and The Crab Claw Restaurant toward the trendy shops and eateries on Talbot Street, stopping only briefly to gawk at the low-slung beauty with the sharply raked masts tied along the quay. 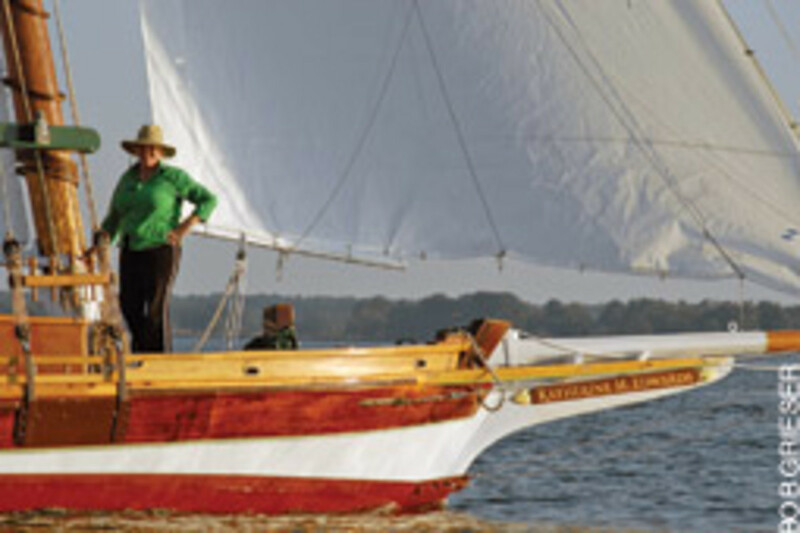 Though virtually all of them had come to catch a glimpse of Bay history and lifestyle, few realized the Katherine M. Edwards is a direct descendant of Eastern Shore boats that worked under sail — a piece of history built by Dickson, John Hawkinson and a grassroots program of tidewater craftsmen and artisans. 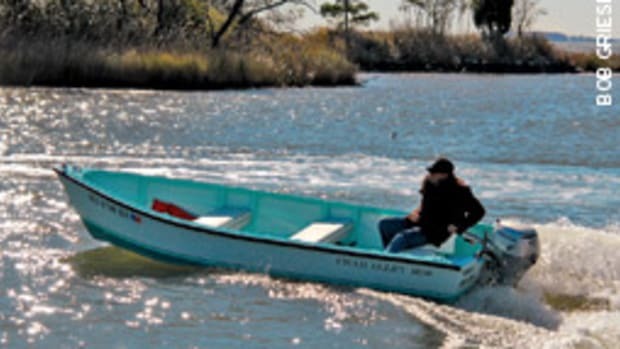 According to Hawkinson and Dickson, the Katherine M. will be the first “working bugeye” on the Bay in nearly 90 years, and the late-afternoon outing was her first sail — a few hours on the Miles River in light air and flat water that left Dickson smiling. 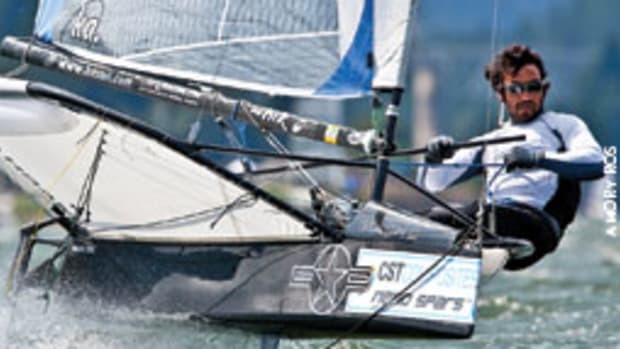 There were, of course, small adjustments to be made: sails that didn’t hoist quite as smoothly as silk, sheet and halyard leads that bound slightly, an awkwardness here and there that Dickson couldn’t abide. But, then, all boats are projects in progress, and the Katherine M. was still being fine-tuned. Time would seem to be of little concern, especially since Dickson and Hawkinson are 29 years into their project. 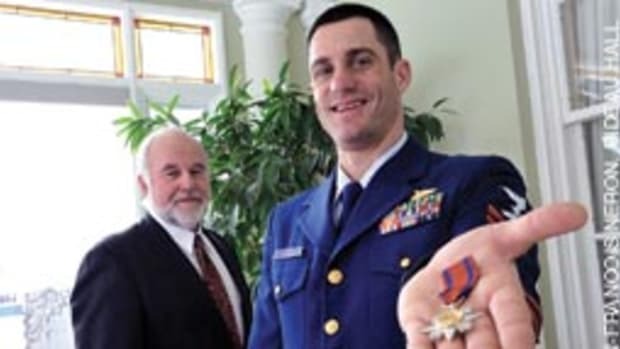 But back in October 2007, Dickson — a traditionalist with heavy hands and a wry sense of humor — seemed anxious to complete the project. 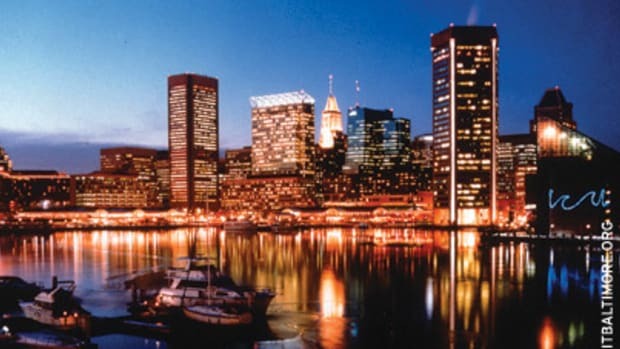 While the project languished, people from Delaware, Maryland, Virginia and elsewhere heard of the Katherine M. and started a grassroots program with donations of time, labor, equipment and supplies. The project became as independent as its leaders. Dickson made his living moving and replanting enormous trees, and selling motorcycles. He raced the traditional and tricky log canoes of the Eastern Shore. He raced cars; he and his wife, Bridget, spent their honeymoon riding across the United States on a motorcycle with a side car — and made much of the trip off-road. Hawkinson is smaller and quieter, a retired obstetrician and gynecologist with a penchant for precision woodworking. Together they take great delight in boats. In the early years Hawkinson, too, could not find enough time away from his medical responsibilities to work on the bugeye. But each of them always knew they would regroup and complete the project. Unlike other living history projects with support foundations and extensive funds, Hawkinson and Dickson have recreated history with a minimal private budget. The hull of the Katherine M. is built in the traditional method, by taking measurements from a half-hull model scaled at 3/4-inch to a foot. “The model is built just like the Katherine M.,” Dickson says as he retrieves the half-hull from a shelf in the small office. “You need a measurement, you take your calipers and mark it down, then you transfer it to full size on the hull. 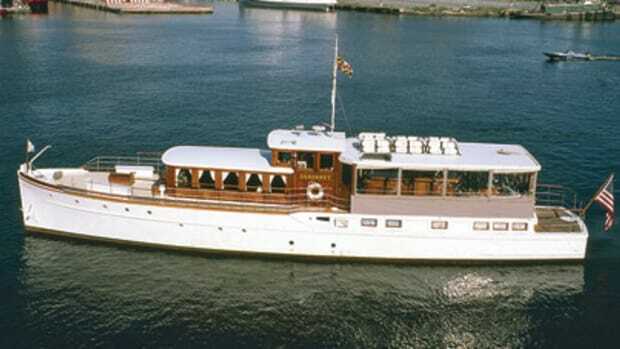 The Katherine M.’s hull is built from 11 logs of loblolly pine heartwood that have been shaped largely with hand tools, joined with heavy drift pins and faired across the tops to present a flat bilge, upon which knees, ribs and planking are added to deck and bulwark level. Knees and ribs are carefully fitted to the top of the hull, and planking is fitted outside. Even the drift pins are authentic, Dickson notes, coming from the Southside, the last wooden ferryboat used to cross the Tred Avon River between Bellevue and Oxford a few miles down the road. Lynn Spicer, a logger in nearby Dorchester County, heard of the project and donated the loblolly pines that became masts. Four or five area sawmills donated mill time and materials. The Alexandria (Va.) Seaport Foundation shaped the spars. First, Dickson and Hawkinson squared each of the 70-foot logs using a chain saw, a guide bar, and block and tackle. Then the four-sided forms were cut lengthwise to form eight sides, then 16 and finally to round. To cut the logs, Dickson says, a number of tools were used, some dating back to the 1600s: adzes, axes, two-handed scrappers, electric and gas-powered saws. During the process, the pine was treated 40 to 50 times with various mixtures to kill creepers and borers, and seal the wood. The inside edges of the hull logs were coated with pine tar and drawn together with bolts carefully mortised into channels, allowing the tightest fit and creating an extremely solid hull. 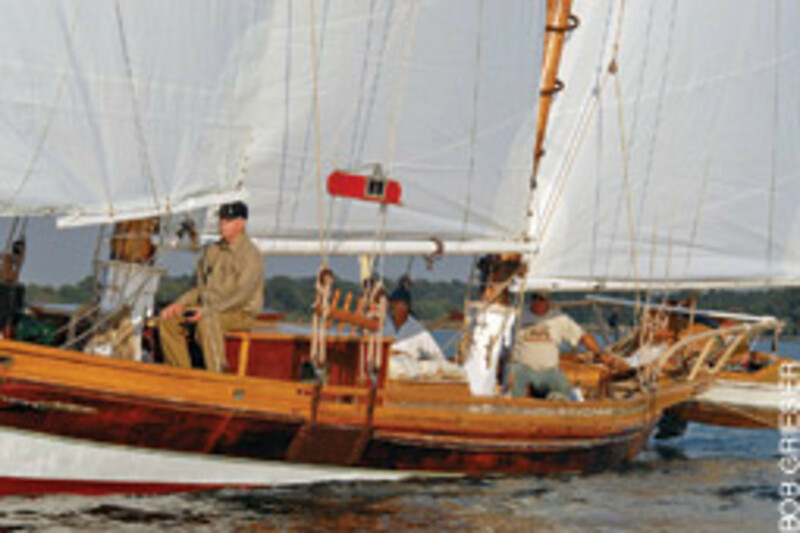 In the heyday of these craft during the 1880s, Dickson says, it cost about $800 to build a standard bugeye, without sails. “They’d build them in less than a year,” he says, running his hand along a nameboard crafted by Claiborne, Md., artist Rennie Johnson. “They’d start them in December and have them ready for the start of oyster season on Sept. 1. In old photographs, Tidewater landings can be seen chock-a-block with sailing craft, many of which were the low-slung, two-masted bugeyes. The Katherine M. has been built to a slightly higher standard. A mahogany king plank runs the length of the deck, and the knees are rot-free Osage orange. The cabin posts are made from a plank from the Wye Oak, donated by the State of Maryland after the historic Talbot County tree was uprooted by a storm a few years ago. “There are other people [still living] who have built these boats, and there are certain things you look for,” says Dickson. 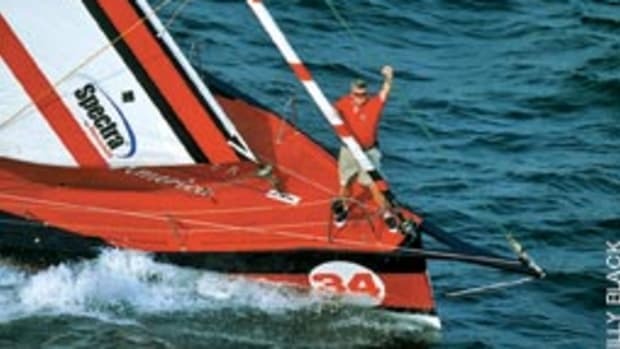 “For example, the beam should be half the length, the centerboard should be one quarter of the length, and the bowsprit is as long as the boat is wide. But one also has the feeling Dickson and Hawkinson have done it in their own time and in their own way. 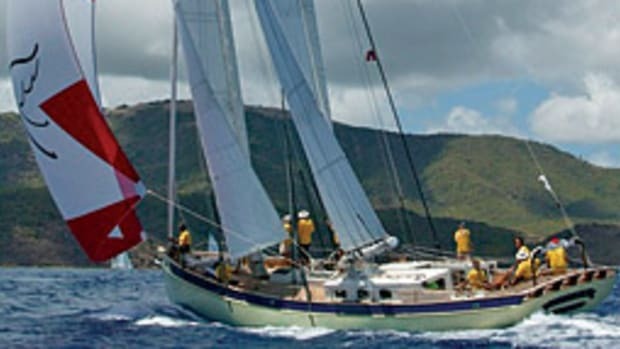 On that first sail in early October 2008, photographer Robert Grieser found Dickson in his element aboard the Katherine M. when the breeze piped up just a little and the sails filled, the rudder bit and the bugeye heeled slightly to port and began to foot out the Miles as hundreds — if not thousands — of working boats had before her. 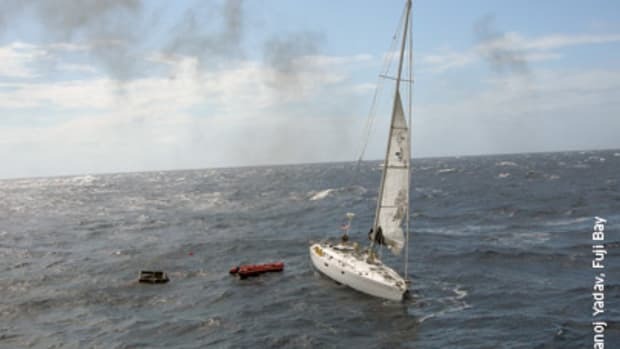 Dickson was sitting to leeward, one arm on the tiller, the other around his wife, Bridget. “You might say it has been 28 years, because that’s when we started felling trees,” Dickson says a few days later. “But this has been in my mind for more years than that. Eventually, we’ll pick up a cargo and sail it up to Baltimore, like they used to do a hundred years ago. 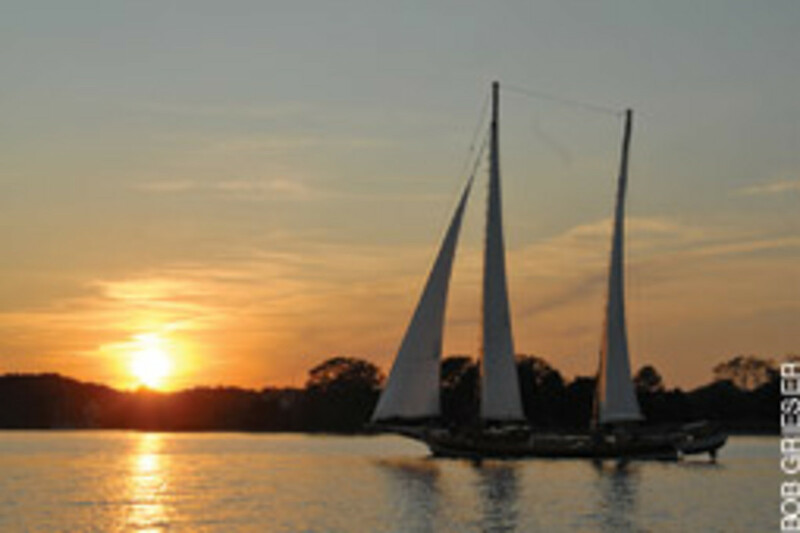 This article originally appeared in the Mid-Atlantic Home Waters Section of the January 2010 issue.